Every day, 9 a.m. - 5 p.m. Ticket office closes 20 minutes before the closing time. € 10,00 for the inhabitants of the Metropolitan City of Cagliari (valid for two weeks). Throughout history the crypt has had different uses: in the late-Punic Period it was probably a quarry of limestone blocks; subsequently it became a place of worship; it was later re-used as an amphoras storage until the first century AD; then it was abandoned for twelve centuries, before being re-used as a place of worship. There was another period of neglect, caused by the increasing success of the nearby new churches of St. Anna and St. Francesco. At the beginning of the sixteenth century it was rediscovered and cleaned again. 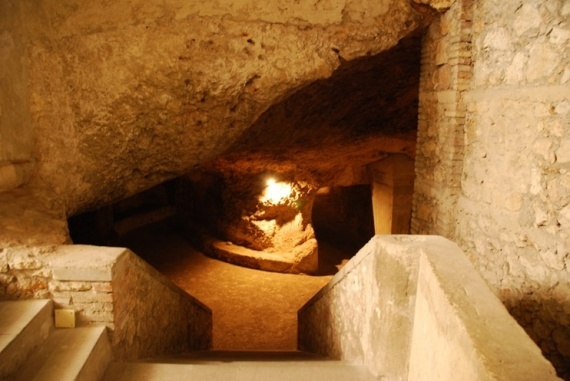 The crypt consists of a large central room connected to the outside by two staircases carved into the rock. The walls were decorated with paintings, of which it is now visible that of St. John the Baptist with his right hand in blessing, dated to the thirteenth century. On the main altar is placed the marble statue of Santa Restituta, while on the minor altar were the simulacrums of the Saints Giusta, Giustina and Enedina. Following the finding of the relics in 1614, the Bishop of Cagliari, Francisco Desquivel, ordered some embellishment works: the raising of the altar and the creation of three recesses, in the central one there were the relics of the four saints and the statue of Restituta; and in both sides, probably, there were the statues of Eusebio, Bishop of Vercelli, and abbess Eusebia, that were, according to tradition, the children of Santa Restituta. On the west side there is another altar placed on an existing cistern and bell. On the same side, there is also a space called Schola Sanctae Restitutae, which is the place where, according to tradition, the saint would have given lessons to the children of the neighborhood. During the Second World War, the crypt was re-used by Cagliaritani people as a shelter; the saint's relics were hidden in the church of St. Anne to protect them from bombing. They lay abandoned until the rediscovery in 1997, in a seventeenth-century wooden urn, covered with fabric and bearing a scroll that identifies them as relics of Santa Restituta.